We arrived in Orlando on Thursday after a red eye to Toronto, then a plane-full of WDW runners from Toronto to Orlando. We were on the little train that takes you from the terminal to baggage claim/check in and the girl across from me asks, “Excuse me, but are you Leana?” Turns out it was Shannon, a fellow Goofy runner and blog reader who recognized me. We chatted a bit and wished each other luck. Shannon, I hope your races went well this weekend! While my folks waited for the luggage to come out I ran down to the Budget counter to get the rental car. Things were looking grim as there were a bunch of people being told that there was at least a 20 minute wait for their desired car type. One fellow was asking his wife, “Do we want to spend an extra $10 a day to get a car right now?” I think they opted to wait. I got to the counter and was helped by a rather nice fellow. He asked all kinds of questions like “What are you here for?” “How many people are with you?” “How many suitcases do you have?” I let him know that I needed to add an extra driver on and he asked “Oh, is that for your spouse?” Ummm, no….I don’t have a spouse…it is for my dad. Upon hearing that he told me he would upgrade me for free to an SUV that was ready right now…you know…for our luggage and and all. I’m not going to question how that worked, but I was happy to not have to sit around and wait for our requested full size car to show up. We loaded up our suitcases and drove off. After a quick bite to eat at Downtown Disney’s Earl of Sandwich we headed off to the race expo. We arrived at the expo about 15 minutes after it had opened and it was busy… My mom went off to pick up her half marathon race packet and I stood in line for my Goofy packet. The line moved swiftly and before I knew it I had my Goofy shirt and my orange Goofy wristband on. After that it was off to the Runner Relations booth to see if I could move up from my assigned corrals upon production of my Nike Women’s Half result. It turns out that the sub 2:15 half was good enough to get me into Corral C for both the half and the full so I was pretty happy about that. Once that was all taken care of I hit the booths downstairs to pick up my goody bag and a few race souvenirs. At one booth they had the brand new Asics Gel Kayano 14s on for a really good price. Since they retail for about $100 more across the border I figured this was a good time to get some new shoes. 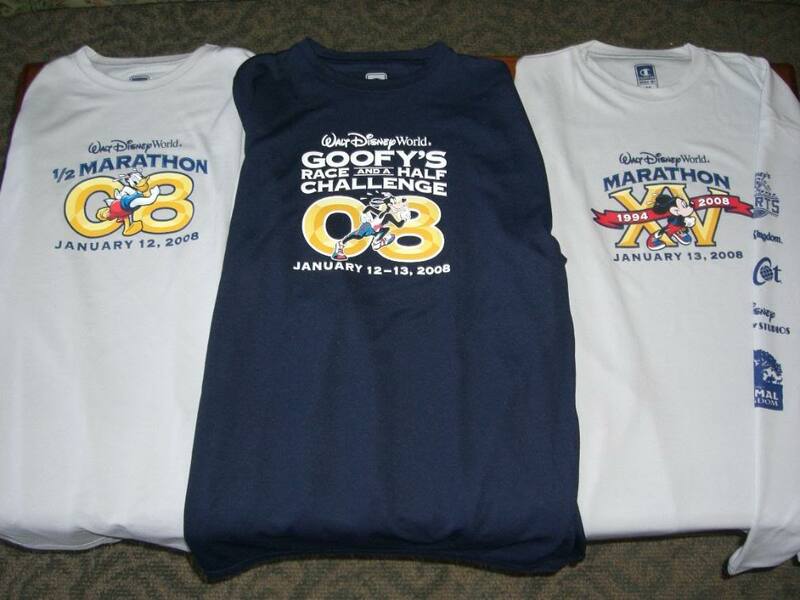 The best thing about going Goofy is you get three race shirts. I have to say I really like the navy blue Goofy shirt. It is definitely my favorite. I went to bed at 8:30 on Friday night, but then proceeded to wake up at 10:30 and at 1:30. At 1:30 that was it, there was no more going back to sleep. My dad graciously got up early and drove my mom and I to the start and hung around with us. I went through the porta-potty lines a couple of times and then it was time leave the staging area and to head off to the start line. At that point I was able to meet up with my cousin Melinda and her husband Mike. Melinda ran the full here in 2006 and she and Mike ran the Goofy in 2007. Melinda and I have been talking about racing together for ages, so it was great to have them both out there on the course. They weren’t looking at breaking any records as they both wanted to run pretty slow so I figured this was a great opportunity to keep pace with someone else instead of push myself too hard on my own (and regret it on Sunday). M&M were assigned to Corral B, but they dropped back to C so that we could start out together. We kept an even 12:00/mi pace the entire way. The miles were speeding by and Disney was great about having entertainment all along the way. There were bands and deejays all along the highway. Just before hitting the Transportation and Ticket Center (TTC) there was a brief split in the course – you got to choose your entertainment! We opted for Disco Drive over Headbanger Highway and Disco Inferno was blaring (probably one of my favorite disco tunes, and it is definitely my brother’s favorite disco tune so it made me smile and think of my big bro). Then we were at TTC and the energy there was AMAZING! All kinds of people cheering, cowbells, signs….it was terrific! It provided a big surge in energy. After that we were running towards the Contemporary. As you run under the channel for the Seven Seas Lagoon you have one of the few hills on the course. From the Contemporary it was just a bit longer to the entrance of Magic Kingdom and the run up Main Street. The feeling of running along Main Street is indescribable. It was one of my favorite parts along the course. My dad was supposed to be out there but I couldn’t see him. He was there, but we zoomed by so quickly that he missed snapping a picture. We stopped for a quick bathroom break in Tomorrowland, then in Fantasyland there were a few characters out to take pictures with. We stopped to say hi to Winnie the Pooh. Side note….if I knew that my t-shirt had such an adverse reaction to sweat I might have chosen to wear something else… Oh well, you live and learn. We ran through the castle, hoped for a good picture and all of a sudden we were back on the highway to return to Epcot. At that point we opted to insert walk breaks a bit more frequently but we were still keeping that 12:00/mi pace. There was more entertainment along the highway on the way back and it still felt like the miles were flying by. Before I knew it we were at mile 12 – the entrance to Epcot. I saw my dad cheering and he managed to snap a picture this time. We had a short jog through Epcot around Spaceship Earth up to the lake at Epcot and back around. We passed the gospel choir, then we were out in the parking lot for the last few yards to the finish line. I high-fived Pluto on my way across the finish line….what an amazing race to run! We got our medals, hit the refreshment tent, then headed back to the 12 mile mark. Melinda and Mike spotted their friend Heidi at that point and jumped in to keep her company a bit and I waited with my dad to cheer my mom in. Details on the full marathon to come! I enjoyed reading about your half marathon adventure. I am looking forward to reading about your full. 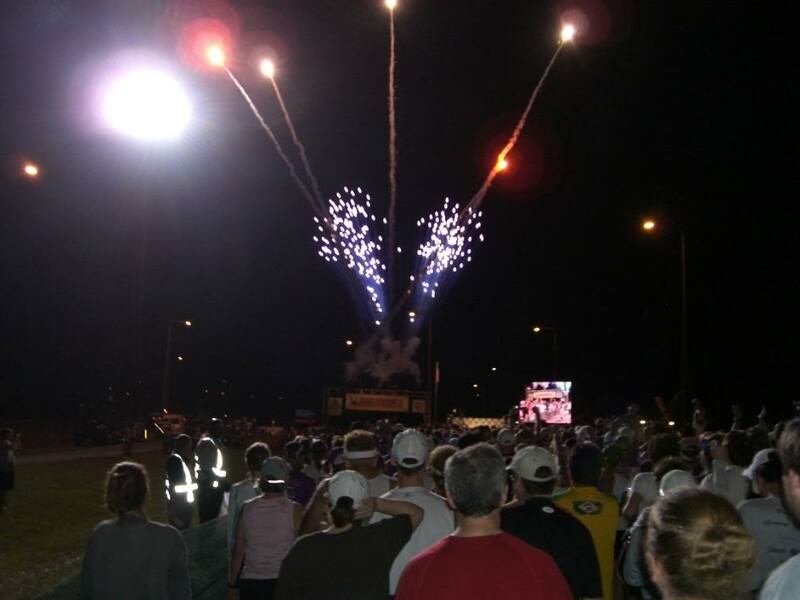 My husband and I signed up on Monday night…I can’t wait to do the race. Oh by the way I stole your countdown clock idea (widget)—different picture though….just thought it was a cute timer. Great story, and having your name printed on the bib is a nice touch. Too bad you didn’t get much sleep on Friday night, but it doesn’t sound like that mattered too much during the half. Sounds like a nice day. 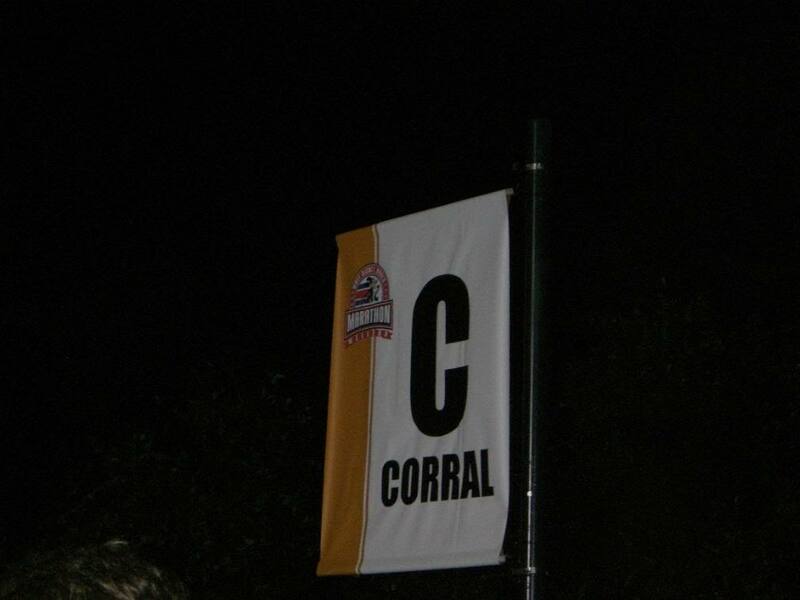 Corral C was a good place to start out! wow, now I want to run this next year. I have that same blue UA shirt!!!! WOOHOO!!! Congratulations! I was tracking you on both days, but there were issues with tracking on Sunday. It sounds like Saturday was a good day for you! I can’t wait to read your report from Sunday. 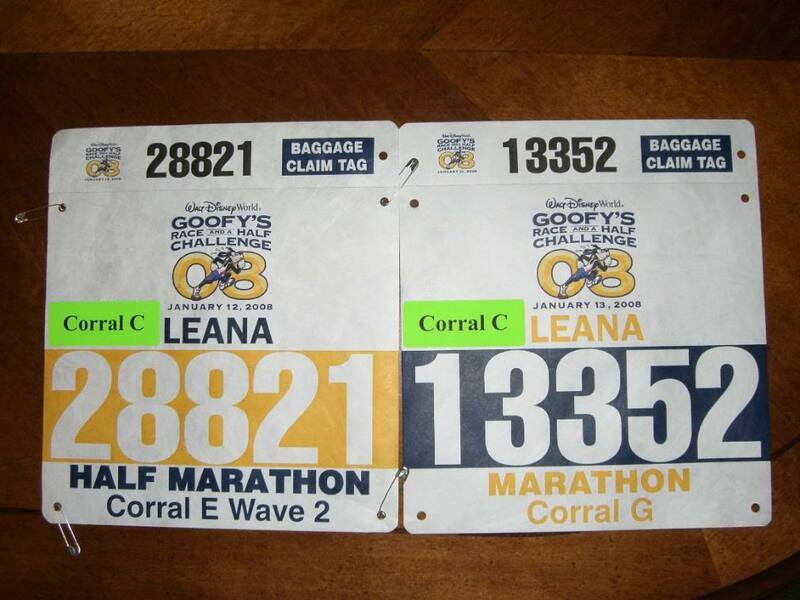 I was registered for next year’s Goofy by 12:10 PM on Monday! Nice race. Looking forward to hearing more about the marathon. Sounds like it was a fun weekend. Sounds like great fun. One of these years the Goofy is on my list. I think I might have to wait till at least 2009 though. We’ll see. It’s fun reading other people’s reports about it though. I’m glad I didn’t scare you at the airport! 🙂 My races went rather well… finished the half in 2:50 (stuck to the plan of walking every other mile). Full didn’t go so well as my IT band didn’t allow me to run. I ended up walking the whole thing. But I finished in 6:31 and I was happy!